It was drizzling and foggy as we drove around Cape Ann, looking for a good place to take people today. We settled on going south because the wind was already starting up from the north. Not a lot, mind you, but enough to make diving on the north side of the island bouncy. So, even though it was becoming just overcast, we weren’t expecting much. We had Linda and Kerry Hurd plus their friend, Cindy, as well as Linda Giles and Myanna on board. Kerry and I just wanted clear enough water to do some video. Linda and Myanna wanted dinner. We found warm, clear-ish water at Saddle Rock off Coolidge Point in Manchester-by-the-Sea. I saw a lobster charge my camera that I’d set down for a shot. 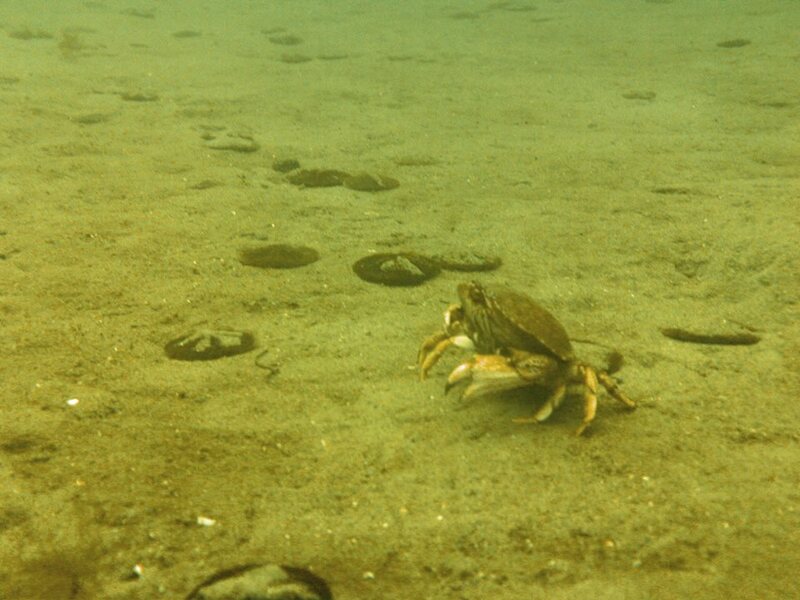 There were lots of crabs eating the floating scraps of sea weed. It was really warm water. They found more critters here as well. Kerry was able to shoot a swim through that had sunlight filtering through behind it. We’ll have to wait to see how that comes out. On the ride home, everyone (including gulls) benefited from snacks. I got an Oreo cookie, The Captain got two, and there were veggies with dip, courtesy of Cindy. Although it clouded up considerably for the ride home, and I wore my wetsuit just in case it started to rain, the skies stayed rain-free. And – I docked the boat in a reverse wind for the first time with no muscle power from anyone else. Woo Hoo! Good day with fun people. Can’t wait to do it all over again next weekend. Mike Wankum (WCVB’s weatherman) was right. It was much cooler, dryer and brighter than we’d been seeing last week. The rain did, however, leave its calling cards – surge and sucky visibility. But the water was WARM. What a trade-off. We had LD and Charley Gaylord as well as Pete, The Captain and me on board. We drove north, over the top, and headed to Gully Cove in Rockport. There were other divers getting ready on land as we anchored in about 30 feet. There were at least two groups of 15 kayakers coming and going by our stern on their way from Rockport Harbor to the outer eastern edge of Straitsmouth Island and back. You wouldn’t be happy to see all the floating sea weed and kelp shards if I had turned the camera around. We made the second dive on the other side of the rocky point, nearer to Old Garden Beach. 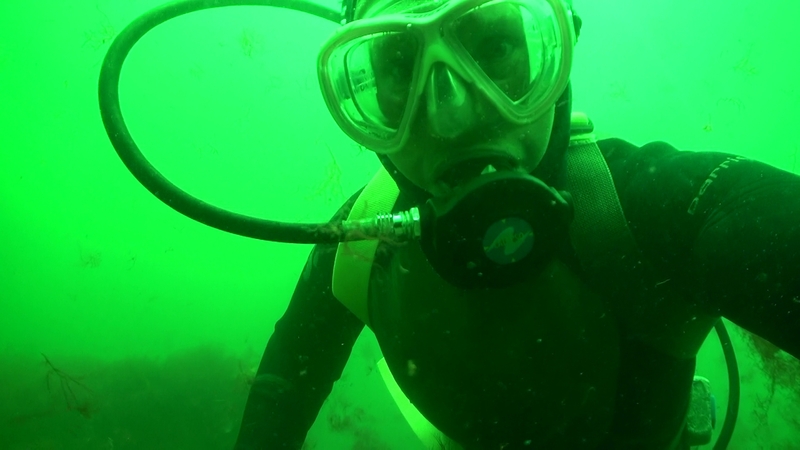 It was only 5-10 feet of visibility here, but I was able to swim up into the shallows to get out of the surge. It was a comfortable and cool voyage with lots of sun for company. Now, if the water were only clearer, it would have been an underwater picture perfect day too. The hot weather finally left. Today was crisp and clear and warm and lightly cloudy. Above water in the low 80s. In the 60s on the surface, but in the 50s below the thermocline at 15 feet. We had Charley and Brenden G., Jim Castelli, Alan Hicks, and John M. aboard for a trip north. First stop was the Lobster Pool restaurant’s “back yard” at Folly Cove. Boulders, rusted iron chain and square-ish pieces of quarried granite litter the bottom here. It must have been a busy loading dock for the nearby quarries. The whole eye was iridescent and shimmery. And, of course, un-blinking. The dive was over too quick and we were off to Lanesville Shores for the second plunge. 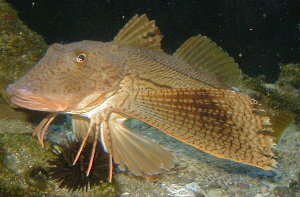 Here I saw lots of little cunner, several skates, and more flounder. Maybe they’re gathering in groups to make more flounder. Maybe it’s their Comic-Con. 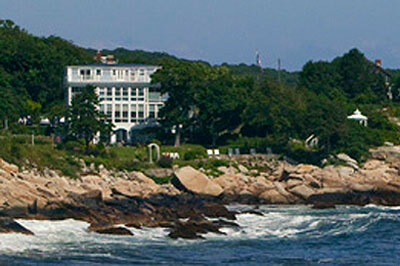 Or they’re all on vacation in beautiful Cape Ann water. We enjoyed flat, calm seas with only an occasional rolling episode from passing Sunday Drivers. I could eat the north end of a south-bound duck. Where’s Veronica and all the legal treats? Read all about it here. We had a full boat for a trip to somewhere cooler than the Cape Ann Marina where I had doused myself four times with the hose before we even left the dock. Al Ferzoco, his daughter, Candace, her fiance, Will, and their friend Bob were on board as well as Laura Gallagher and Jennifer Entwhistle. Everyone was eager to get wet. It was even calmer than this photo shows today. It was quiet once everyone was under, but the silence was broken as Candace surfaced to report she’d lost her fin on the ascent. Luckily Laura and Jennifer were nearby and heard the cry. Laura turned to survey the surface and saw the fin drifting gently towards Nova Scotia. We agreed her timing was perfect because they were just ready to descend to look for it. The reports from below were of yucky conditions – 5 feet of visibility with clouds of sea weeds swirling in the turn of the tide. The surface was warm enough to swim comfortably. We decided to move across the channel to the mouth of Loblolly Cove. I pulled into the lee of the south edge for a calm anchorage and away from the stream of boat traffic that passes in front of the cove. We were in about 30 feet of water. I sat on the swim platform and felt warm currents intermingle with the colder ones as the tide swirled by. The breeze died as billowing white clouds built overhead. It didn’t actually rain at all, but there was a fresh cohort of little powerboats skittering towards home at the thought of lightening and rain. To us, it was a welcome respite from the heat and sun. Some hunters returned with dinner. In addition to their successful catch, Will and Pete got up close and personal with a big, but agile, lobster. They also reported lots of pollack. The ride home along the back shore was easy because there was no chop to contend with. The ramp was even flat. WooHoo. The day started overcast with sprinkles in N. Attleboro and on Route 93 as our folks trekked north for the day. We had LD, Mike and Diane Neas as well as Pete with The Captain and me. There was a little chop and some chill in the air as we turned the corner into Folly Cove for a calm first site. Diane and Mike are our daughter and son-in-law, so we didn’t want them to be too uncomfortable as we dived. 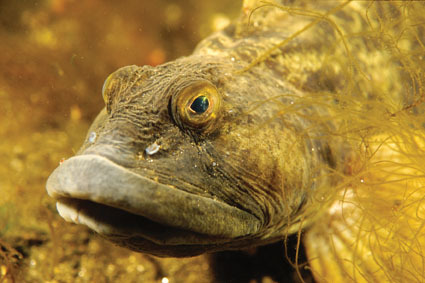 LD especially likes the look of this fish and its bony “legs” that protrude from its pectoral fins. Pete found the dead low tide water temperature to be 66 degrees. No wonder I was so very comfortable in my wetsuit. The incoming tide rolled seaweed, silt, debris and other stuff into my path and I thought it was from the hunters, roiling up the bottom. Nope. They assured me it was just the tide doing its thing. Visibility varied from OK in the shallows to downright messy on the bottom. 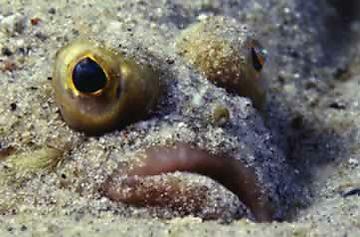 I saw a fat flounder, resting on a rocky ledge. There were many too small lobsters grubbing around in the weeds. For our second place, I chose Lanesville Shores. I anchored in about 25 feet of water and it turned out to be a magnificent, boulder-strewn stretch of shoreline. I think I saw more fish here than were in Folly. They were everywhere – shining their sides to the surface, pinging in and out of my line of sight, and generally being very photogenic. So I set up my camera under a particularly attractive overhang and managed to get some to come right up to my mask for a look. LD had lots of luck here, including two encounters with denizens who were too big to take. He was kind enough to send the kids home with dinner. They had brought fruit salad on ice and I munched on it all afternoon. Sunday, July 7th was not as hot as it had been earlier in the weekend. Don’t get me wrong, it wasn’t comfortable, but it was bearable. I’d even covered the Sun Shower to keep it from overheating the water I depend on to cool off. We had JK, Andy J., Sandy Miller, Linda Giles and Myanna on board with Pete, The Captain and me. Everyone was fine with our first stop at Fisherman’s Canyon in Rockport. This area has beautiful underwater geography and looked clear enough to be fun for everyone – hunters and sightsee-ers alike. Although I didn’t personally witness it, there was an episode of a tank slipping out of someone’s hands and dropping out of sight followed by some emphatic words by the buddy of the tank wearer. “Why didn’t you take out the weights?” was in there somewhere too, I understand. First dive of the season syndrome was cited. We were glad to see that Linda and Myanna hadn’t forgotten their Oreo cookies. They always share. We were also happy to have Andy J.’s “ponchkees” (at least that’s how they sound to me). They’re a light, plum jam-filled, Polish bakery item that he brings with him all the way from Worcester. Great day with fun people. 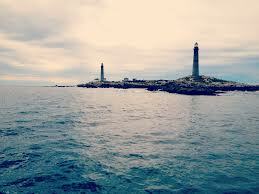 We circumnavigated Cape Ann today. With Alan Hicks, Pete, The Captain and me on board, it was a light load. 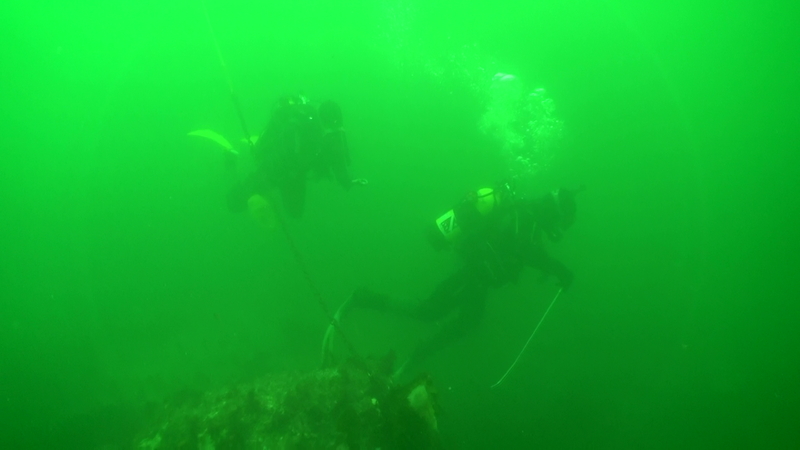 Because there was little wind, we decided to try for The Salvages – a dive site at the far point from our base at Cape Ann Marina. Unfortunately, it was equipped with a rippin’ current, so we quit while we were ahead and made for calmer waters. That turned out to be Folly Cove’s deep point on the west wall. Here we were able to just chill out (did I mention it was baking hot?). The Sun Shower’s fresh water was too hot to actually cool you off. The water was in the high 50s on the bottom and in the low 60s on the surface. We saw lots of people swimming in the cove and many were trekking all the way across from one side to the other. It was pretty hot today. We’d come to the deeper part of Folly Cove at JK’s request. She, Andy, Sandy Miller, Ilya Taytslin and LD were onboard with Pete, The Captain and me. There was barely a breeze and Pete counted 19 boats in the cove between dives. I was trying out my wetsuit again. It was just too hot to climb into my Atlan. Its tight neck makes exiting it a strain, so I usually just leave it on between dives. Not today. It’d be like baking a chicken in a Dutch Oven. My regular weight belt was too much for just a wetsuit. I was wearing my Andros horsecollar inflatable in case of the excess weight. It was inflated most of the time on the first dive. For the second one, I wore my 15 pound tropical belt from the Florida Keys condo time. It has a nice flexible rainbow webbing and the weights are held in place with plastic keepers, not nuts and bolts like my drysuit one. Success! We talked about how a pout works on a little kid. I think this picture from the interwebs shows it perfectly. The trip back down the river was hot, and the beach at Wingaersheek was packed with pleasure boaters, cheek by jowl. There wasn’t any space left against the sand for anyone to pull up and back in. Then it was off to Pete’s for a cookout with lobsters galore.